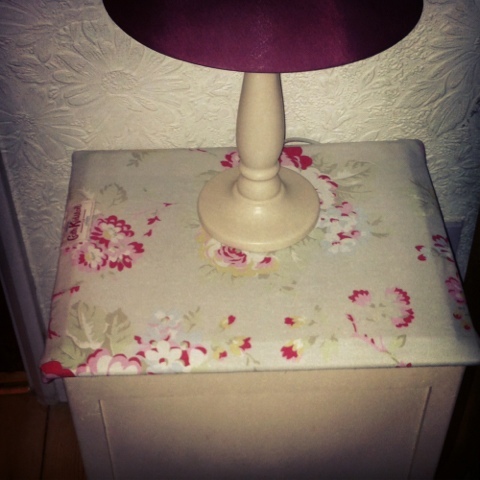 Using some scrap Cath kidston fabric I have covered our bedside table. Well what I call our bedside table is actually one of those old bathroom storage boxes with a weird cork lid perhaps fashionable in the 70's?! Quite handy to have extra storage space as I am such a hoarder and now it looks much better. I am going to slowly rejuvenate things in the bedroom as I am a bit bored of its decor; next targets are to update duvet cover and lamp shade! I can't really buy anything new so i am going to try and use things I already have in my craft stash to up-cycle.